The fruits of being a Floridian. Kumquat, Citrus japonica, is part of the Rutaceae citrus family. “Fortunella is the name given to the kumquat genus in honor of Robert Fortune who in 1846 was the first person to import kumquats into Europe. The name “kumquat” is a synthesis of the Chinese words gam (金), meaning gold, + gwat (橘), a term for tangerines” (UF IFAS). These small, delicious, sweet, and tart, citrus fruits can be eaten whole and turned into a fine array of preserves. Not to be confused with Calamondin, another one of the small and magical citrus fruits that are to be enjoyed. Let’s discover the way Alex D. Hawkes explained and prepared kumquats in his 1967 article “Taking Full Advantage Of Kumquat Season”, for the St. Petersburg Times, in North Florida. Alex, a South Floridian, from a small, botanically lush neighborhood, known as Coconut Grove, in the City of Miami, facing the Biscayne Bay. But why was Hawkes writing for the St. Petersburg Times and The Lakeland Ledger, in the north of The Sunshine State? Mr. Hawkes was a botanist, and was involved with the Florida West Coast Bromeliad Society, that gathered in northern Florida. Alex also divided his time between Coconut Grove “The Tropics”, and Jamaica in the Caribbean, his second home. 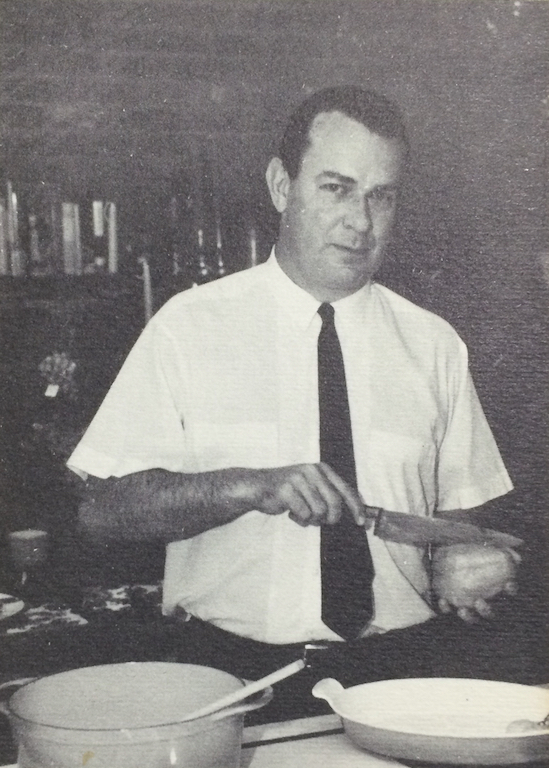 During his Jamaican getaways, he would submit his recipes by post to Jane Nickerson, Lakeland’s food editor. His last columns kept running for several weeks after his untimely 1977 death in Jamaica. Alex was a devoted orchidologist and specimen collector, with a wide range of interests. 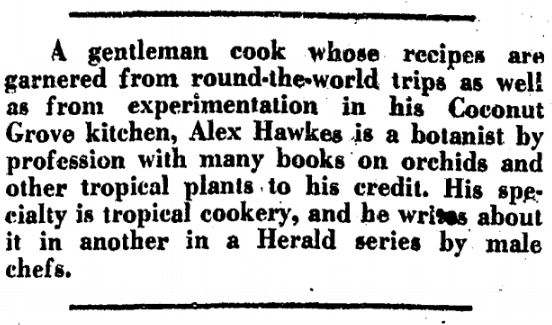 Alex’s botanical adventures took him around the world, into the the jungles of Latin America, the Caribbean, and countless other places, which will be discovered through A.D. Hawkes’ recipes. 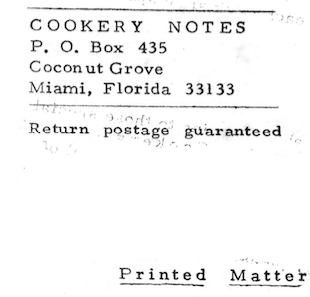 When taking the larger view, then, it becomes clear that the very personal magic he’d bring to life in his small immaculate Coconut Grove kitchen, partook of a larger outside world, and might help explain why, after all these years, his recipes refuse to be contained. This is where Alex would test and adapt the recipes he collected from his botanizing adventures. 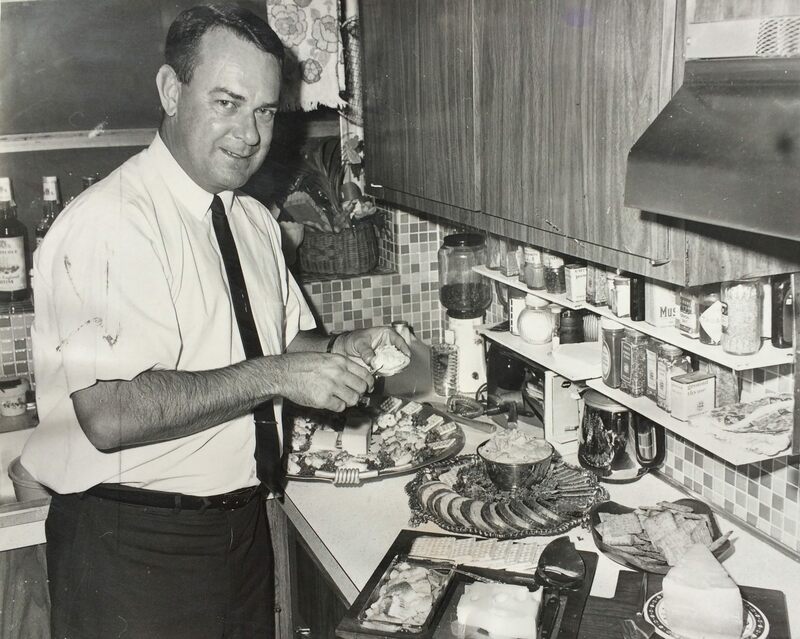 Alex would go on to share these recipes via Florida’s newspapers as a food columnist, and through the cookbooks he authored, leading up to being cited by food writing heavyweights such as Cecily Brownstone, in her highly syndicated AP food column. Alex D. Hawkes carved his path within various botanical circles related to orchids, bromeliads, ferns, palms and more. Alex established the South Florida Bromeliad Society (BSSF), alongside Nat DeLeon and Bob Wilson in 1959. Alex’s botanical connections around the state very well could have linked him up with the St. Petersburg Times paper, the rest is delicious. The BSSF still meets monthly at Fairchild Tropical Botanic Garden (FTBG), in Coral Gables. Enjoy Alex’s recipe, while we add another book to his list of unpublished cookbooks. Was Hawkes pulling our leg when he mentioned he was writing a “Citrus Cookbook”? 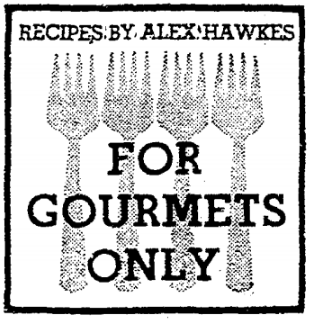 Nonetheless, Alex’s 4 published cookbooks, and his hundreds of newspaper columns for the Miami News, The Miami Herald, St. Petersburg Times, Lakeland Ledger, and The Jamaica Gleaner will satisfy anyone’s desire to explore the lovely world of citrus fruits, with the wide array of recipes Mr. Hawkes shared with his readers during his food writing career. FLETCHER’S PRESERVED KUMQUATS. Who was Fletcher, perhaps Alex’s nice friend that gave him the marvelous quantity of beautiful fresh kumquats? Wash the firm kumquats, and using a big darning needle, prick each fruit several times. Place fruit in a large heavy saucepan, add boiling water to cover. Simmer until the fruit is tender – (usually about 20 minutes). Remove kumquats from water with slotted spoon. Add sugar and lime (or lemon) juice to water, and bring to a boil, stirring often. Boil for five minutes, then return the kumquats, and cook them over very low heat until they are semi – transparent, usually about an hour. Allow kumquats to stand in syrup overnight. Next day, bring fruit and syrup back to the boiling point. Remove kumquats from syrup with slotted spoon. Pack them into hot sterilized jars. Cook syrup until thickened. Pour over, the kumquats. Seal the jars.